Hello again! Since I talked to you last my life here in the forest has been full of adventure, though I haven’t seen any more pale-faced two legged creatures. Today I have another interesting story to tell you. It is about the great day that is upon us today, World Tapir Day! 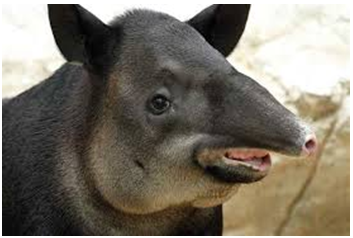 To celebrate, I want to tell you about the other types of tapir that exist in the wild like me. 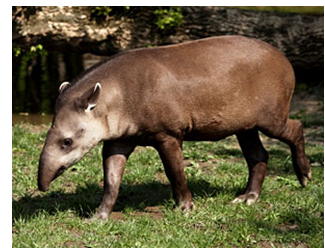 I am the Brazilian tapir. I am dark brown all over apart from the tops of my ears which are white. Another kind of tapir is the Baird tapir. They are the biggest land mammals in Central America. They look different to me as they have cream markings on their face and throat. 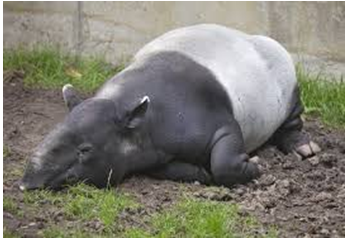 The Malayan tapirs, which I talked about last time, the ones living in Edinburgh Zoo, are the largest of us tapirs. In fact, when humans see them they are often surprised by their size (and cuteness!) 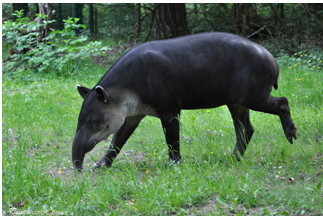 In the wild these tapirs are found in parts of Indonesia and the Asian mainland. Mountain tapirs are the smallest breed and they’re also much furrier and wooly. They can be found in Colombia and Ecuador. Unfortunately all four breeds are endangered. This makes me extremely sad, and it has made some humans sad too which is the reason they have set up World Tapir Day. Today’s aim is to create better awareness of us tapirs and to raise funds to protect our homes from the humans who don’t value us. Before I go I’ll let you in on some tapir secrets! We’re really shy animals and this is why we are not often seen in the wild – we like to keep to ourselves. This is the reason many humans don’t recognize us. We tend to live alone or in small families and we communicate through scent and shrill calls. I hope you have learned something new today. Now you can go and tell all your friends about World Tapir Day, I’m off to celebrate it with my friends. If you want to see the work this organisation are doing you can visit their twitter, and go to their website. Don’t forget you can always find me within the pages of The Adventures of Martin Rattler. Follow us on Twitter @Martin_Rattler and like us on Facebook at MartinRattlerbook. Happy World Tapir Day and happy reading! Next Next post: We’re so excited… and we just can’t hide it!